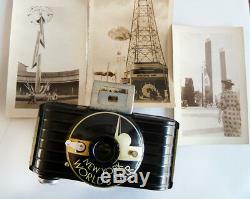 RARE 1939 NEW YORK WORLD'S FAIR KODAK BULLET CAMERA w/ Extras Modernist. 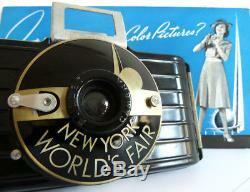 Up for sale are 7 items featuring an Art Deco 1939 New York Worlds Fair Bakelite Camera. These are highly sought after as very few were produced. This stunning camera sports a streamlined, Bakelite black body, metal accents, and glass lens. 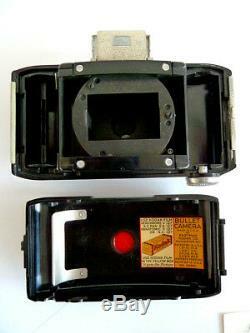 The design & text on the front of the camera is metal, and is inset into the Bakelite. The body has wonderful curved sides with raised parallel horizontal lines that run across the back and front. This camera was designed by the famous industrial designer Walter Dorian Teague (search his name) who was also one of the supervising designers of the 1939 New York Worlds Fair. This sale includes a total of (7) seven items, read on.. 1 Original Camera, in excellent condition, no chips, no cracks, no dents, Bakelite is very clean condition... Please view photos for condition. 2 8x10 inch framed photo of. 3 8x10 inch framed photo of the Camera Store inside. The Kodak Pavilion at the 1939 New York Worlds Fair. 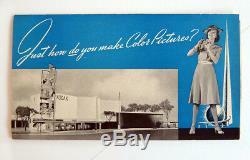 4 Original Kodak fold out brochure that features the front of the. Kodak Pavilion at the 1939 New York Worlds Fair. 5 Three (3) Original snap-shots taken presumably by this camera at the. 1939 New York Worlds Fair. This is the best and LAST one in my collection.... Serious collectors will know how rare these items are, they display very well. Great for your collection or as a gift. 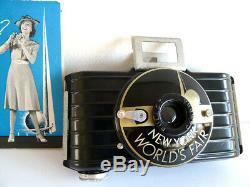 The item "ULTRA RARE 1939 NEW YORK WORLD'S FAIR KODAK BULLET CAMERA Extras Modernist MCM" is in sale since Friday, January 11, 2019. 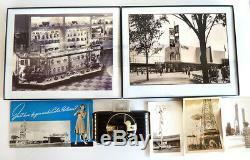 This item is in the category "Collectibles\Historical Memorabilia\Fairs, Parks & Architecture\Fairs & Expositions\Worlds Fairs\1939-40 New York". 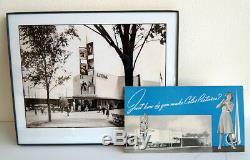 The seller is "global-foto-archive" and is located in Pennsylvania. This item can be shipped to United States, Canada, United Kingdom, Denmark, Romania, Slovakia, Bulgaria, Czech republic, Finland, Hungary, Latvia, Lithuania, Malta, Estonia, Australia, Greece, Portugal, Cyprus, Slovenia, Japan, China, Sweden, South Korea, Indonesia, Taiwan, Thailand, Belgium, France, Hong Kong, Ireland, Netherlands, Poland, Spain, Italy, Germany, Austria, Mexico, New Zealand, Singapore, Switzerland, Norway, Ukraine, Croatia, Malaysia, Bangladesh, Bermuda, Brunei darussalam, Guernsey, Gibraltar, Iceland, Jersey, Cambodia, Liechtenstein, Sri lanka, Luxembourg, Monaco, Macao, Maldives, Pakistan.